The Ross F1 is a large arbor, carbon fibre fly reel designed and built for serious anglers. With its eight point contact system, lightweight design and high tech appearance the reel is one of the most innovative on the market. - Eight point smooth carbon fire disc drag system with 2 square inches of surface area. This increases the stopping power of the F1 flyreel and dissipates heat far more effectively than other models. - The spool, drag system handle, stabilizer and spool release system are made almost entirely from carbon fibre, providing extra durability and strength, while decreasing the overall weight of the reel. 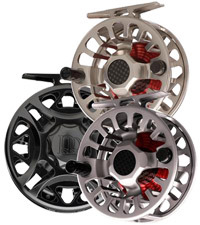 The reel is also designed with a one piece frame and spool, making it a very strong and durable model. - The fully sealed clutch bearing of the Ross F1 fly reel is designed "in house" by Ross. It isn't exposed to moisture or dirt that can negatively affect performance. The full drag system is sealed by ten o-rings. - Ross F1 Size 5 is designed to take line weights 10-12, and this balck spool has an anodised finish making it ideal for saltwater use.